To help you create link-worthy content that has the potential to generate credible referrals and backlinks, and give organic visibility a boost, here are five types of content worthy of consideration. Marketers are always looking for credible facts, statistics, and insights to not only understand more about their industry and keep up on trends, but also bolster their own content. As a result, original research can be an incredibly powerful and link-attracting piece of content. For example, the Content Marketing Institute’s State of B2B Content Marketing Annual Report is a something we often reference and link to in our own blog posts. With statistics that highlight common content marketing trends, patterns, and pain points for B2B marketers, their report helps us learn more about our industry, but also reinforce our some of our own marketing philosophies and present the facts. As a result, CMI’s 2018 report has over 2,000 inbound links. Conducting your own industry research, however, is a time- and resource-intensive task. We know this first-hand from our own experience working with DivvyHQ to create our 2018 Content Planning Survey. To make sure that you’re putting together accurate, quality research, there are some guidelines you’ll want to follow. For instance, you’ll want to get a large enough sample size for your survey or study to ensure that your findings represent your industry accurately—you don’t want to collect only a few responses from people you know. In addition, avoid open-ended questions when conducting research as you’ll want to make sure that your findings are quantitative. And as with any content you create, make sure you have a robust amplification plan in place to drive awareness. In the end, if you’re able to put together fresh, useful research, your audience will find value and insight, and sources who cite your research will be compelled to link to your report, increasing your number of inbound links and (hopefully) rankings. Original research isn’t the only thing readers and sources rely on to find new, relevant insights that help them tell their stories. As a visual, engaging way to digest a lot of information at once, infographics are another type of linkable asset that resonates with readers and sources alike. Loaded with quotes, graphics, statistics, and more, infographics house plenty of information without overwhelming your audience. Packed with helpful insights, it’s no wonder that other sites will link to a beautiful infographic over a text-heavy white paper. For example, GetVoIP, a cloud communications advisory, created an infographic on “How To Get More Energy At Work.” The infographic resulted in 66 inbound links and was also picked up by Entrepreneur.com. If you’ve already done some original research as suggested above, creating an infographic is a great way to promote or get some additional life out of your research report. However, infographics can also be curated from credible sources representing statistics, quotes, and data in new, visual ways. To create infographics that readers and sources alike will appreciate, look at your existing content for repurposing opportunities. For example, you could take one of your top-performing, stat-packed blog posts and turn it into an infographic for an easy win. Or, find credible sources with data points that support the tips or takeaways you want to share and turn them into fun graphics. And of course, make sure the data and facts included are highly relevant to your target audience, and you have an amplification plan in place. 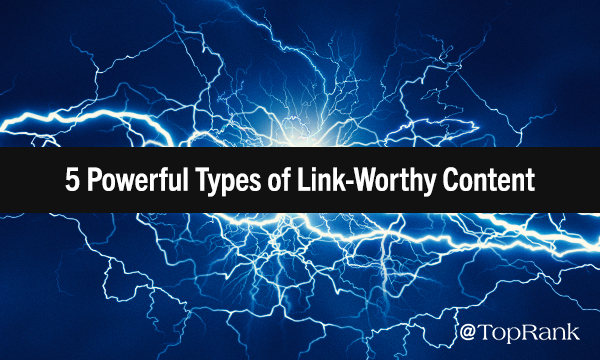 The two previous types of link-worthy content focus heavily on earning links through data. However, data isn’t the only link-worthy type of content. Inbound links are also earned by providing helpful tools and resources to your readers. The more “bookmark-able” resources you can produce, the more links you have the opportunity to capture. What kind of tools or resources are we talking about? Check out HubSpot’s Blog Ideas Generator as an example below. While there isn’t a lot of visible content on the page, there is a lot of value in the tool itself as it can help solve a big pain point among their target audience: writer’s block. And the results of providing something so useful are substantial with the tool generating over 12,000 inbound links and 200 ranking keywords. Besides an idea generator, you could also create a calculator, calendar, or even just a listicle of helpful tools and resources. As an example, our own blog post featuring over 100 Search Engine Marketing Resources is one of our most linked-to pages with 3,114 inbound links. Rankings are also helpful, link-worthy types of content. People want to know who the best people are to follow on LinkedIn, what tools are best for employee advocacy, or what the top tactics are for generating leads. And creating a ranking is one of the ways you can offer those recommendations. Content that shares valuable, must-know information is what earns the most links, and rankings definitely tick that box. Plus, the individuals or brands featured on your list are also likely to share and link to your ranking in order to promote their accomplishment. 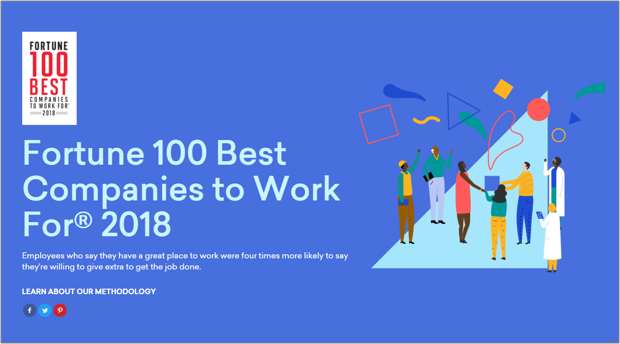 In fact, Great Place to Work published their annual list of the Fortune 100 Best Companies to Work For and received over 350 inbound links in just under six months. When creating your own rankings, make sure you have a set process or methodology. There needs to be a clear rationale behind your choices. This shows your readers and potential link sources how you reached your ranking decisions, adding to the credibility of your list. And again, make sure you have an amplification plan in place before launch. Another type of resource that gets a lot of attention from other sources on the web are guides and tutorials. As the “one-stop shop” for everything you need to know on a given subject or task, guides and tutorials are helpful links for others to add to their content. 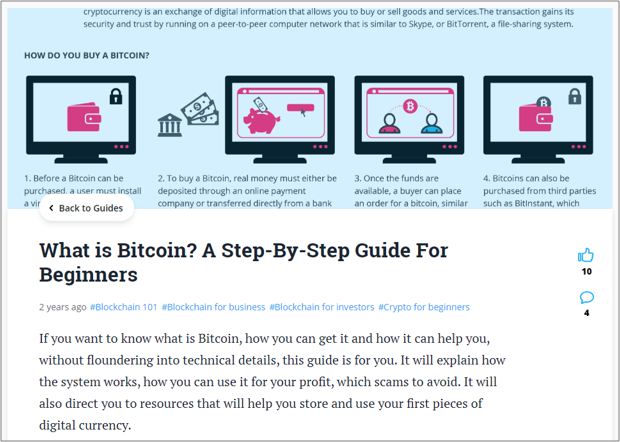 For example, Blockgeeks, a blockchain training and education platform, created an in-depth guide on Bitcoin containing over 2,800 words. The power page has resulted in over 800 inbound links and 180 ranking keywords for Blockgeeks. Those keyword variations should then serve as the outline for your guide, ensuring that you cover all of the relevant questions and topics your audience and sources might like to learn about. And while it’s already been said in this piece, I’ll say it again: make sure you have an amplification plan beyond SEO to drive awareness, engagement, and clicks. No matter how many tactics you find here and elsewhere, there simply is no substitute for creating content that others may find useful. Earning backlinks is one of the most important factors when it comes to improving your organic search rankings. Have a highly competitive word you want to rank for? Check out our guide on how to rank for competitive keywords.